Yes, that is a weapon. No, I don't know how it works. The level of customization available in Guncraft just got even deeper and more intense: Gunsmithing has as of today officially been released to the public. 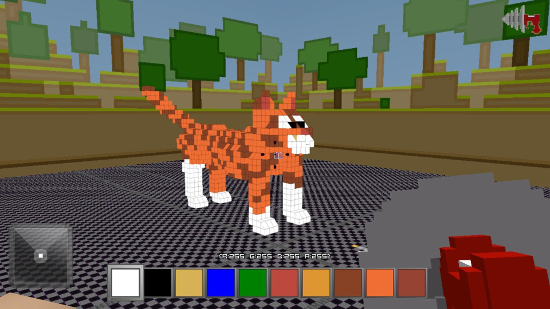 Players can now build their own weaponry within the same voxel-based construction engine used to create maps. General design, bullet appearance, and iron-sight graphics are all completely customizable. 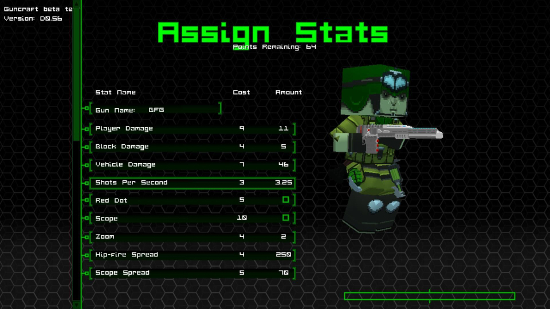 Once the general look and feel of a weapon is down, players can then move on to customize the weapon's stats, receiving 100 points to distribute between fire rate, ammunition, accuracy, damage, projectile speed, explosion size, weapon size...you get the idea. I've already gotten the chance to fiddle around with it a little, and it's very, very fun (the fact that I can't seem to design a decent-looking weapon notwithstanding). Disclaimer: I didn't make this. I've attached last week's press release along with the Gunsmithing trailer below. It's a touch dated, but it'll nevertheless walk you through everything you need to know about Gunsmithing, as well as the title's new status as a Greenlit title. Twain Harte, CA - July 2, 2013 - Exato Game Studios and Reverb Publishing invite players to get ready for an exclusive new feature that demonstrates the power of creativity in the recently fan voted Steam Greenlit, Guncraft, coming July 11, 2013 to online digital retailers and Steam later this summer. 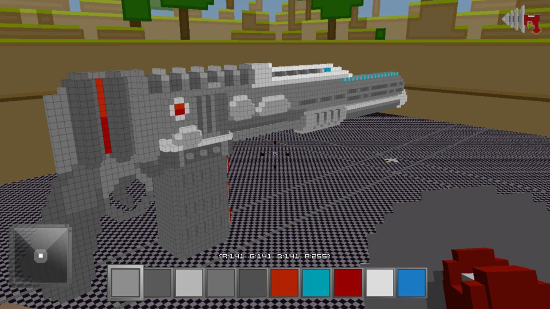 Utilizing Gun Smithing, Guncraft players will be able to build up their dream weapons - block by block - each customized with their own unique weapon properties. From the fire rate, ammunition type, explosive damage, custom sights and even weapon size, each weapon feature can be deeply modified. "We are so thrilled about being Greenlit, it is a dream come true. We literally couldn't have done it without the support from our amazing fans," said John Getty, Executive Producer and Lead Game Designer of Exato Game Studios. "Being Greenlit on Steam is really going to unlock the full potential that Guncraft has to offer. Expect a lot of epic things to come in the future." With the ability to create such weapons as futuristic miniguns or the infamous grenade launching catgun from PAX East, players will only be limited by their imaginations when creating their signature weapon. The powerful Gun Smithing feature is the same toolset used by Exato Game Studios development team when they create weapons, and fans will be able to unleash their destructive creations when Guncraft officially launches for Windows PC on July 11, 2013. Players can pre-order Guncraft now at Desura, GOG, Green Man Games, Rain Digital Games, Gamefly and on the Guncraft website. Guncraft was recently Greenlight approved on Steam and now joins the select group of community voted titles Greenlight approved on Steam. Marrying the addictive nature of block building sandbox games with the speed and competition of modern first-person shooters, Guncraft has been wowing gamers in its on-going beta. Players can create arenas and levels based on anything they can think of, and once complete, utilize these stages for fast-paced shooting action. Players have all of the standard multiplayer shooter modes such as Deathmatch and Team Deathmatch, plus tons of custom loadouts, perks, plenty of weapons, vehicles and much more. Add to that, the core crafting mechanics of Guncraft that are available in all game modes enabling players to build structures, character classes, and weapons on the fly and then decimate everything in sight. With tons more entertaining updates planned in the future, get ready to "Block and Load". To learn more about Guncraft, please visit www.exatogames.com/Guncraft/, as well as ‘Like' it on Facebook and follow the game on Twitter for all the latest developer updates and news. Exato Game Studios was founded on the premise of creating indie games of the highest caliber. Its first title, Guncraft, aims high in its grand goals of pushing the envelope, by offering one of the most diverse, user-driven, and customizable first-person shooters to ever be created. Launched in 2010, Reverb Publishing offers digital publishing to independent game developers, combining production and business development support paired with the proven public relations and marketing agency expertise from its parent company, Reverb Communications. Reverb's unique model is form fitted for studios, ensuring they receive the majority of the game's revenue and maintain ownership of their titles while Reverb handles non-developmental tasks including production support, navigating QA, and preparing for product submission. For more information about Reverb Publishing, please visit www.reverbpublishing.com. Want To Be Sure That Your Mail Won't Explode?